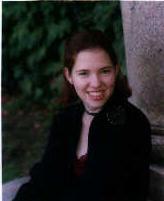 Awards and Honors Dean’s List 2001, Dean’s List 2002, Smith Alumnae Scholarship, Catherine Wilder Scholarship, Independent Summer Study Scholarship, alternate candidate for a Fulbright Grant to Iceland 2002, Recipient of the Anglo-Swedish grant for research 2003. Other Academic Accomplishments: I received my BA in 3 years! Also did a special study during my BA turning out a 57 page thesis: Medieval Iceland: The Rise and Fall of the Commonwealth AD 930-1264 Spring 2001; Master's Thesis/Project: A Runic Workbook for Beginners. I also participated in the University of Minnesota’s Summer Icelandic Program and the Sigurður Nordal Institute Program (Summer 2001). Aspirations To become a teacher and inspire students to learn more about foreign languages and cultures.